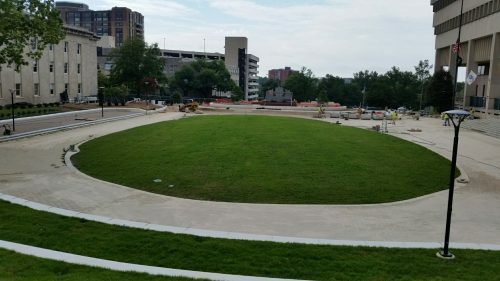 Despite record rainfall this summer that continues into the Fall, the Patriot Plaza renovation project in Towson, Maryland, nears completion. The Plaza, which stretches between the Baltimore County Circuit Court and the Historic Courthouse, will provide inviting green space and flexible program areas for community use. JMT Architecture and JMT Landscape Architecture worked together to design the space, which is being constructed by North Point Builders. One of the unique features of this project site is the fact that the Plaza sits on top of the County’s Office of IT and Emergency Management Center. Taking into account the underground office space, the Plaza design includes a complex surface-subsurface stormwater conveyance system. The virtually invisible system collects and diverts rainwater away from the subterranean roof. What can be seen in this design is what sits above the ground: the green space offered to the public for community use, family-focused programming, and a reprieve for local professionals and busy visitors. A priority of the improved Plaza was to increase the green space between the courthouses. In the design, the paved area was reduced and replaced by green space, flexible seating, a rain garden, and areas to gather and relax. “We regraded along Chesapeake Avenue and added a dynamic feature wall to make the Plaza more inviting and visible. The goal is to increase usership, to welcome people to Towson and offer them a great public space to enjoy,” said Lead Landscape Architect Andrew Mears, RLA. Dealing with unprecedented weather has been a challenge for the project team. Records indicate that in July alone, the Baltimore County area saw more than 16 inches of rain, only 2 inches shy of the record for single wettest month (1955). On March 2, a wind storm damaged recently installed insulation board and drainage mat on the Office of IT and Emergency Management Center’s roof. The project is due to be delivered to Baltimore County in the Fall of 2018. JMT Architecture and Landscape Architecture came together as a team to create a design that addressed practical concerns, was as flexible as possible for the community’s needs, and improved the Plaza’s accessibility following ADA guidelines. JMT continues to coordinate closely with North Point to complete this important project that has been challenged by a record-breaking rainy summer. Below is a video rendering of the space developed by JMT Architecture.